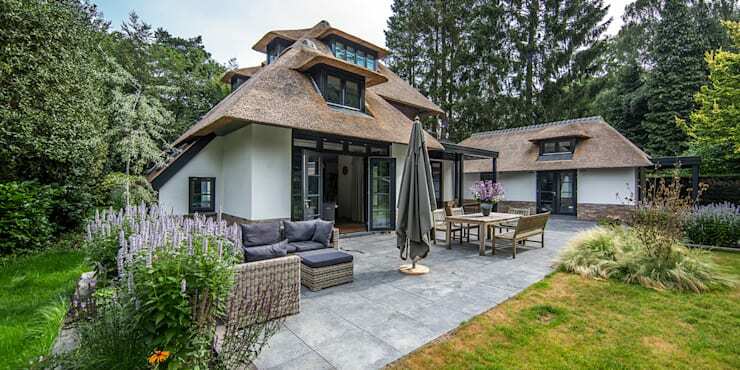 Today we travel to the ancient forests of Naarden, where we will explore a newly built thatched roof home in the Gooi region outside Amsterdam. The area is famous for having one of Europe's best preserved ancient fortifications dating from the 17th century, so it's no surprise that the home is inspired by classic Dutch architecture. Unlike much traditional East Asian architecture, old European architecture is commonly designed to stand out from its surroundings rather than operate on an open, holistic level with its surroundings. So although this is a contemporary home with lovely outdoor areas, it's also a home with a strong commanding presence. 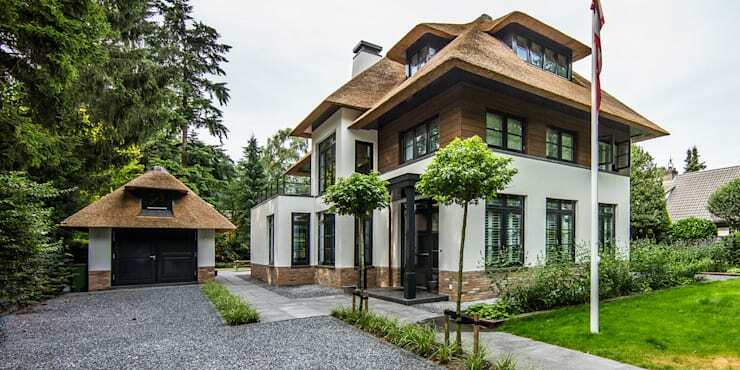 The architects Denoldervleugels, have countered this classic dominance by creating a variety of masses of different sizes. 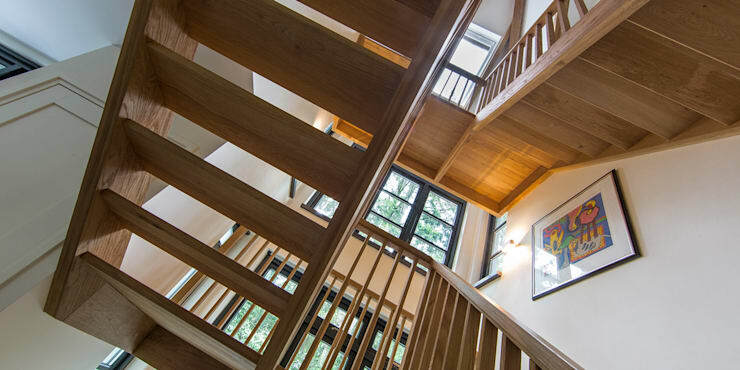 It's an impressive home, but also one built on a human scale built for relaxed, open plan living. Come with us on a photo tour to explore this impressive thatched villa. We are certain you will enjoy the journey! The main building has a monumental presence and an impressive thatched roof with two layers. The lower half of the building has large contemporary windows. But the change in style works well with the distinctive roof. Much of this is due to the choice of materials. The lower ground level is built from older style bricks and the upper level is constructed in dark wood. Finally, note the special dormer windows set into the roof. These aren't common in many older thatched homes. So it's lovely to see such a feature in a newly built home. On the side of the home, we have a better view of the different forms that make up the building. The roof jumps in scale from impressive to homely. This is most apparent in the very steeply sloping area to the right that belongs to the kitchen. It's a very homely, humble corner that reminds one of old fairytales and Tolkienesque buildings. The lush forest surroundings make for a very attractive outdoor area. The surrounding tall trees on all sides give the home a very private, snug feel and there's a feeling of being cut off from the rest of the world. At the same time, the scenery has been enhanced with the addition of a small grassed country garden. The pretty purple colours of the lavender provide the garden with a lovely scent as well. Despite the loveliness of the surroundings, this part of the world receives unpredictable and often cold weather. So here, we have another outdoor space with better shade. It's a generously sized area that could potentially contain a small heater in the colder months. What's great about this area is that it runs off two sides of the home. This gives it lots of protection from the wind and creates a very natural relationship with the indoor spaces. Finally, we love the simple wooden bench. This is a country home, and as we will see in a moment, all the furnishings are appropriately rustic in nature. The long wooden dining table is fashioned from thick wood with lots of natural textures. This blends perfectly into the timber floors of the dining room and subdued, natural ambience of the open-plan living space. The variations in the roof height we explored earlier, also create an impressive peaked ceiling. This adds to the impressive feel of the space. It is a rustic home that straddles two styles with relative ease. We will finish our tour up with the central staircase. It is large but rustic and simple. 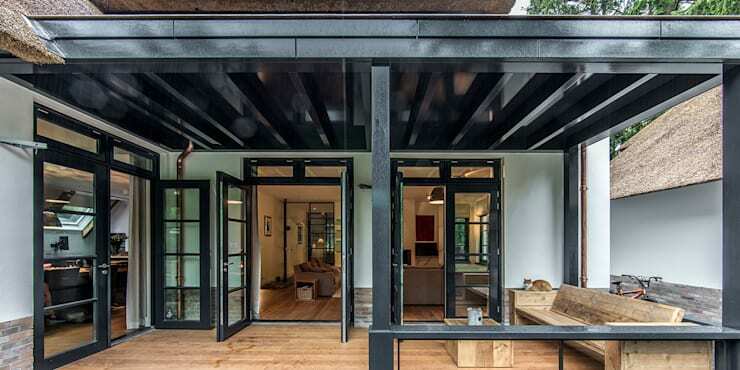 The open slats and loosely arranged wooden beams allow for lots of natural light to penetrate the interior. 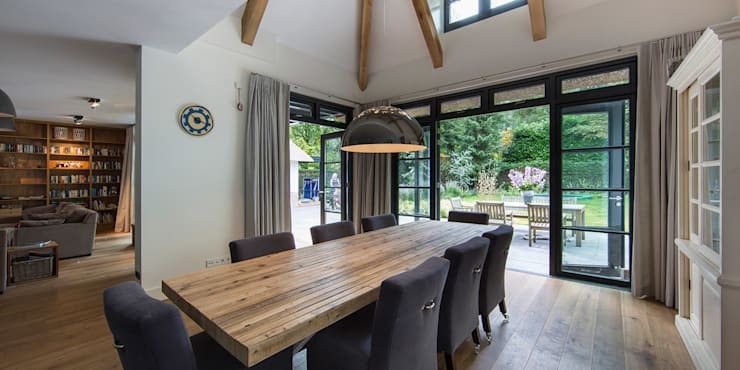 This is a contemporary rural home after all, and the large windows and upper dormer windows have been installed to invite natural life inside this classic home. If you're interested in impressive rustic homes, you'll love A Rustic Home with Contemporary Flair. 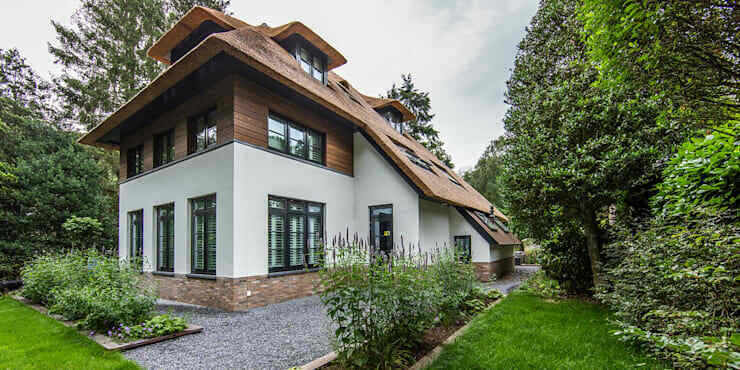 What do you think of the thatched roof in this country home? We would love to hear your ideas in the comments field below!